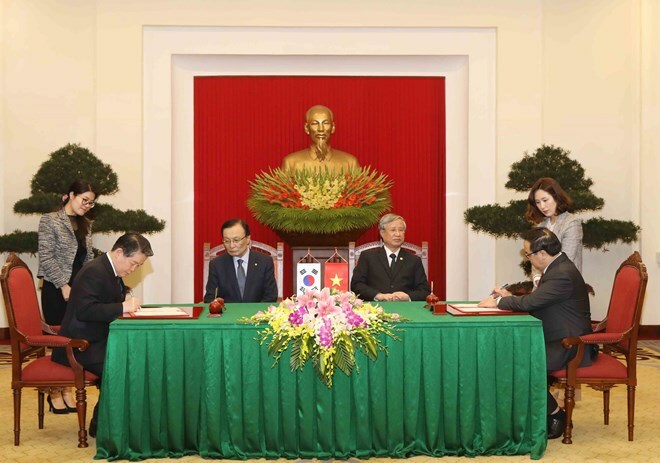 Hanoi (VNA) – The Democratic Party of Korea (DPK) wants to strengthen its friendship and cooperation with the Communist Party of Vietnam (CPV), helping to push the Vietnam-Republic of Korea (RoK) relations to a new height, said DPK Chairman Lee Hae-chan. The DPK leader made the statement at a meeting with General Secretary of the Communist Party of Vietnam and President Nguyen Phu Trong in Hanoi on March 26. Lee said he was impressed at Vietnam’s rapid changes and development. He briefed on the RoK’s socio-economic situation as well as the DPK’s policy on foreign affairs and national development. For his part, Trong stressed that Lee’s ongoing visit is an opportunity for leaders of the two parties to meet and enhance mutual understanding and trust. He applauded the signing of a memorandum of understanding (MoU) on boosting cooperation between the CPV and the DPK. The leader urged both sides to work closely together to realise the pact, which will contribute to consolidating the bilateral friendship and deepening the Vietnam-RoK strategic partnership. 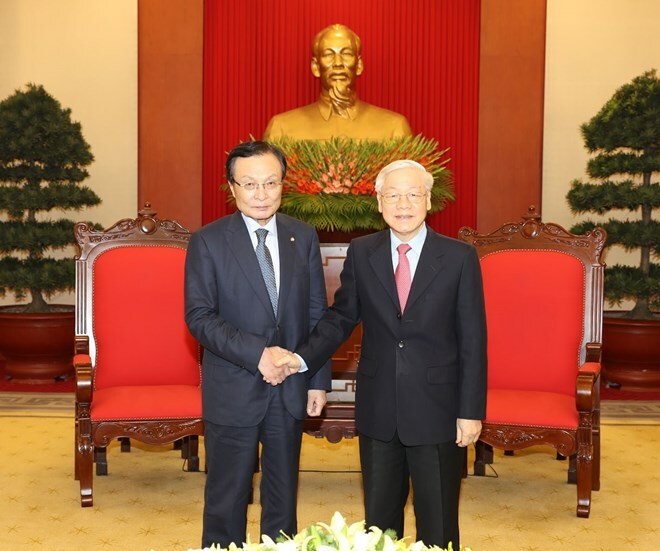 Earlier the same day, Prime Minister Nguyen Xuan Phuc hosted a reception for Lee and his entourage. Phuc said Vietnam-RoK relations are growing comprehensively in multiple fields. The RoK is now the biggest foreign investor, second biggest ODA supplier, and third biggest trade partner of Vietnam, he said, adding that the country also ranks second in terms of foreign tourist arrivals in Vietnam. The government leader asked the RoK side to continue creating favourable conditions for Vietnamese citizens living, working and studying in the RoK. Lee vowed to join efforts made by the two countries and their party leaders in fortifying the bilateral ties. He hoped Vietnam will continue facilitating RoK firms investing in the nation. Both leaders affirmed their determination to push Vietnam-RoK trade to 100 billion USD by 2020. 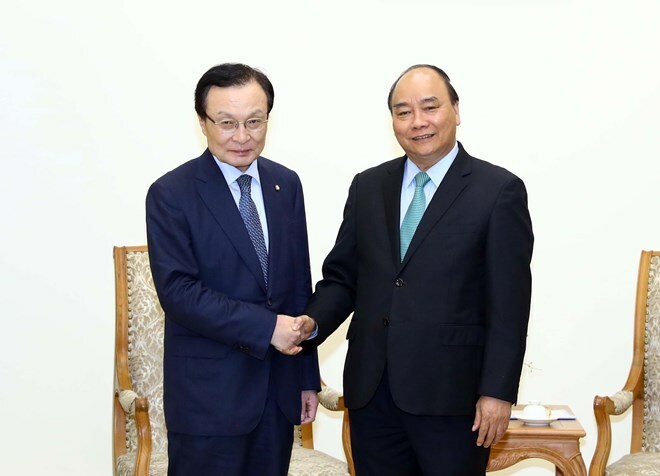 Also on March 26, Politburo member and permanent member of the CPV Central Committee’s Secretariat Tran Quoc Vuong held talks with DPK Chairman Lee Hae-chan. At the talks, the two sides informed each other on the current situation of their respective nations and parties. Vuong and Lee also exchanged their ideas on measures to enhance ties between the CPV and the DPK in the time ahead, as well as sharing information and their views on international and regional issues of common concern.